Quality Features : # 1.Thermal Cut-Out # 2.Heaviest Inner Tank.3.Anti-Vaccum System.4.Automatic Thermostate5.Power Saving Insulation6.Built In Pressure Release Valve7.Isi Marked Heating Element,Thermostate & Cut-Out # 8. 7 Tank Processed Powder Coated Body With Plastic Top Botttom To Save It From Rusting # 9.Extra Heavy Heating Element For Extra Durability # 10.Extra Thick Capsule Type Inner Tank.11. 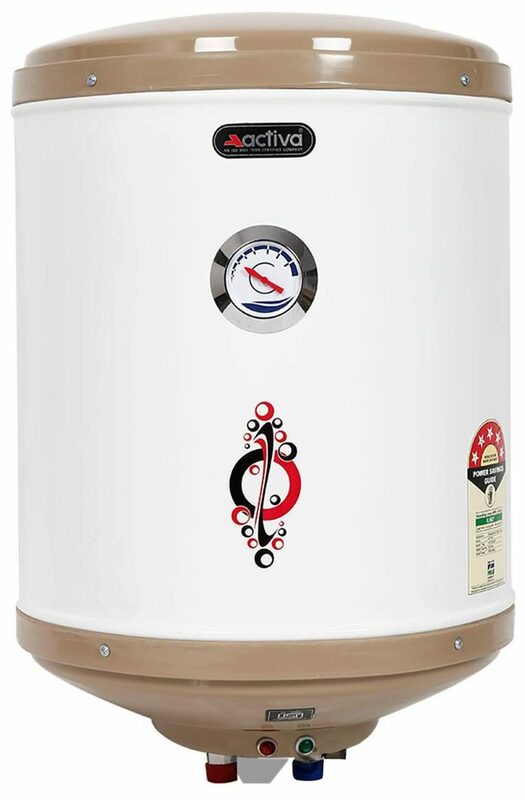 This Activa Geyser, Is A 5 Star Performer And Comes With A Stainless Steel 304 L Stainless Steel Inner Tank .12.The Isi Approved Activa Electric Geyser Facilitates Faster Heating With Its Two U Heating Elements And The Thermal Cut Out Protection Prevents Overheating.13.This Water Heater Can Hold Maximum For 4 Level Story / Building.14. Comes Along With Magnissium Anode For Long Life In Hard Water.15. 5 Star Rated Electric Gyser To Save Your Electricity Bills. # 16.Elegant Designing With Plastic Top Bottom Covers To Look More Attractive # 17.Activa Amazon Electric Gyser Comes Along With Temprature Meter. # The images represent actual product though color of the image and product may slightly differ.